Maybe you drink craft beer on a regular basis, maybe you’re just setting out to begin tasting some new beers, but either way you’ve definitely asked yourself this question: what makes a beer “craft” and why should I drink it? I recently spoke with Mike Tymchuk, Brewmaster at Cumberland Brewing Company, a brewery focused on the virtue of community and the production of high quality beer. According to Mike, “craft” doesn’t refer to the size of the brewery or the location of its production, but simply to the ingredients a brewer uses in production. He explained that the “craft” title was adopted as means to avoid penalization for outgrowing the tax bracket that used to be associated with “microbrewery” status. Where microbreweries were distinct from the big national producers based on values of size and worth, craft breweries are distinct based on their usage of high quality ingredients. The big national producers in Canada – Labatt, Molson, and Sleeman to name a few – cheat in the production process. Instead of using a high-grade barley to produce sugar, the big nationals rely on corn and rice starch to cut corners, save cost, and produce a lesser product. From here, the difference between craft and not-craft is a grey area among brewers. Some believe the only ingredients that should be used are the four core ingredients: barley, hops, water, yeast. 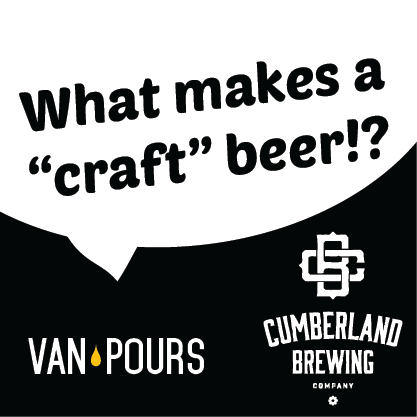 Others, like Mike at Cumberland Brewing, believe that as long as the brewer is using barley, not cost-cutting alternatives, other ingredients may be used to create highly reputable craft beer. Mike used the example of including vanilla to produce a tasty vanilla stout. Now you’re locked and loaded for the next time someone asks you what makes the beer in your hand “craft”. The key is the ingredients. There are no shortcuts being taken and no unwanted garbage in your beer. Craft beer is brewed with integrity. If you’re in the Comox Valley on Vancouver Island, stop by and try some genuine craft beer brewed for the hard working Cumberland community by the Cumberland Brewing Company. 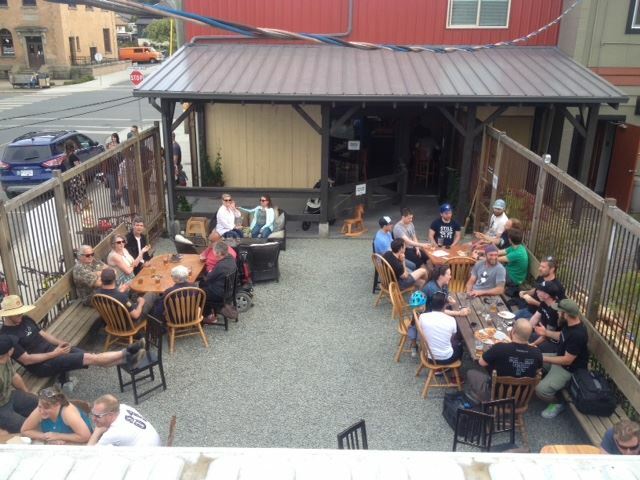 The patio is open during the summer, growler and squealer fills are available from six different taps, and the staff serves up some fantastic food. Visit Cumberland Brewing Company on Facebook! This entry was posted in beer, comox valley, craft beer, cumberland, vancouver, vancouver island and tagged bc craft beer, comox, comox valley, craft beer, cumberland, cumberland brewing, cumberland brewing company, local beer, pouroftheday, pours, van, vancouver, vancouver craft beer, vancouver island craft beer, vanpours. Bookmark the permalink.